Malcolm X, sometimes stylized as X, is a 1992 American epic biographical drama film about the African-American activist Malcolm X. Directed and co-written by Spike Lee, the film stars Denzel Washington in the title role, as well as Angela Bassett, Albert Hall, Al Freeman Jr., and Delroy Lindo. Lee has a supporting role, while Black Panther Party co-founder Bobby Seale, the Rev. Al Sharpton, and future South Africa president Nelson Mandela make cameo appearances. This is the second of four film collaborations between Washington and Lee. Malcolm X's screenplay, co-credited to Lee and Arnold Perl, is based largely on Alex Haley's 1965 book, The Autobiography of Malcolm X. Haley collaborated with Malcolm X on the book beginning in 1963 and completed it after Malcolm X's death. Malcolm X follows the life of African-American activist Malcolm X. Rising from a troubled childhood, in which his father, a preacher, is murdered by the Black Legion and his mother is institutionalized for insanity, Malcolm gets a job as a Pullman porter, calling himself Detroit Red. After getting involved with a Harlem gangster named West Indian Archie with whom he has a falling out, Malcolm flees to Boston and decides to become a burglar. He and his best friend, Shorty (played by Spike Lee) are arrested by the police and Malcolm is sentenced to a ten-year prison term. In prison, a fellow inmate, Baines, introduces him to the teachings of the Nation of Islam. Malcolm begins religious conversion as a disciple of Elijah Muhammad. During this fervent immersion into the Nation of Islam, he becomes an incendiary speaker for the movement changing his name to Malcolm X and marries Betty Shabazz. Malcolm X preaches a doctrine of separation from white society. However, a pilgrimage to Mecca softens his beliefs, teaching him that Muslims come from all races, even whites, and he endeavors to break free of the strict dogma of the Nation of Islam, with tragic results. He is assassinated on February 21, 1965, in New York City. In the present day, numerous children of African descent, both in the United States and Africa, declare "I am Malcolm X." Among them is anti-apartheid activist and future South African President Nelson Mandela who begins quoting one of Malcolm X's speeches. Political activists Bobby Seale and Al Sharpton make cameo appearances as a pair of street preachers. Future South African President Nelson Mandela appears as a Soweto school teacher delivering a lecture on X. Spike Lee regulars Nicholas Turturro and Ossie Davis have minor roles as a Boston police officer and an eulogist, respectively. Michael Imperioli has a brief appearance as a news reporter. "It's such a great story, a great American story, and it reflects our society in so many ways. Here's a guy who essentially led so many lives. He pulled himself out of the gutter. He went from country boy to hipster and semi-hoodlum. From there he went to prison, where he became a Muslim. Then he was a spiritual leader who evolved into a humanitarian." Producer Marvin Worth acquired the rights to The Autobiography of Malcolm X in 1967. Worth had met Malcolm X, then called "Detroit Red," as a teenager selling drugs in New York City. Worth was fifteen at the time, and spending time around jazz clubs in the area. As Worth remembers: "He was selling grass. He was sixteen or seventeen but looked older. He was very witty, a funny guy, and he had this extraordinary charisma. A great dancer and a great dresser. He was very good-looking, very, very tall. Girls always noticed him. He was quite a special guy." Early on, the production had difficulties telling the entire story, in part due to unresolved questions surrounding Malcolm X's assassination. 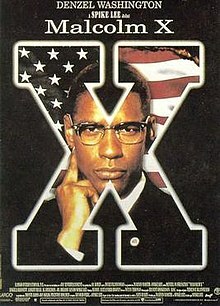 In 1971, Worth made a well-received documentary, Malcolm X, which received an Academy Award nomination in that category. The project remained unrealized. However, several major entertainers were attached to it at various times, including Richard Pryor, Eddie Murphy, and director Sidney Lumet. In 1968, Worth commissioned a screenplay from novelist James Baldwin, who was later joined by Arnold Perl, a screenwriter who had been a victim of McCarthy-era blacklisting. However, the screenplay took longer to develop than anticipated. Perl died in 1971. Baldwin developed his work on the screenplay into the 1972 book One Day, When I Was Lost: A Scenario Based on Alex Haley's The Autobiography of Malcolm X. In 1976, Baldwin wrote of his experience, "I think that I would rather be horsewhipped, or incarcerated in the forthright bedlam of Bellevue, than repeat the adventure". Baldwin died in 1987. Several authors attempted drafts, including David Mamet, David Bradley, Charles Fuller and Calder Willingham. Once Spike Lee took over as director, he rewrote the Baldwin-Perl script. Due to the revisions, the Baldwin family asked the producer to take his name off the credits. Thus Malcolm X only credits Perl and Lee as the writers and Malcolm X and Alex Haley as the authors of The Autobiography of Malcolm X. The production was considered controversial long before filming began. The crux of the controversy was Malcolm X's denunciation of whites before he undertook his hajj. He was, arguably, not well regarded among white citizens by and large; however, he had risen to become a hero in the African-American community and a symbol of blacks' struggles, particularly during the presidencies of Ronald Reagan and George H. W. Bush. In the three years before the movie's release, sales of The Autobiography of Malcolm X had increased 300 percent, and four of his books saw a nine-fold increase in sales between 1986 and 1991. After the public outcry against Jewison, Worth came to the conclusion that "it needed a black director at this point. It was insurmountable the other way...There's a grave responsibility here." Jewison left the project, though he noted he gave up the movie not because of the protest, but because he could not reconcile Malcolm's private and public lives and was unsatisfied with Charles Fuller's script. Lee confirmed Jewison's position, stating "If Norman actually thought he could do it, he would have really fought me. But he bowed out gracefully." Jewison and Denzel Washington would reunite several years later for The Hurricane, in which Washington played imprisoned boxer Rubin "Hurricane" Carter, who spent nearly twenty years in prison for a murder he claimed he did not commit before his conviction was overturned in 1985. Spike Lee was soon named the director, and he made substantial changes to the script. "I'm directing this movie and I rewrote the script, and I'm an artist and there's just no two ways around it: this film about Malcolm X is going to be my vision of Malcolm X. But it's not like I'm sitting atop a mountain saying, 'Screw everyone, this is the Malcolm I see.' I've done the research, I've talked to the people who were there." Soon after Spike Lee was announced as the director and before its release, Malcolm X received criticism by black nationalists and members of the United Front to Preserve the Legacy of Malcolm X, headed by poet and playwright Amiri Baraka, who were worried about how Lee would portray Malcolm X. One protest in Harlem drew over 200 people. Some based their opinion on dislike of Lee's previous films; others were concerned that he would focus on Malcolm X's life before he converted to Islam. Baraka bluntly accused Spike Lee of being a "Buppie", stating "We will not let Malcolm X's life be trashed to make middle-class Negroes sleep easier", compelling others to write the director and warn him "not to mess up Malcolm's life." Some, including Lee himself, noted the irony that many of the arguments they made against him mirrored those made against Norman Jewison. Looking back on the experience of making the film and the pressure he faced to produce an accurate film, Lee jokingly stated on the DVD's audio commentary that when the film was released, he and Denzel Washington had their passports handy in case they needed to flee the country. Washington agreed to play Malcolm X while Norman Jewison was scheduled to direct the film. Still, Lee stated he never envisioned any actor other than Washington in the role. Lee, who had worked with Washington on Mo' Better Blues (1990), cited Washington's performance as Malcolm X in an Off Broadway play as superb. However, some purists noted that Washington was far shorter and had a far darker complexion than the real Malcolm X, who stood 6'4" and had notably reddish hair and a lighter complexion (due to his very fair-skinned Grenadian-born mother's partial white ancestry) and bore only a passing resemblance to him. Spike Lee also encountered difficulty in securing a sufficient budget. Lee told Warner Bros. and the bond company that a budget of over US$30 million was necessary; the studio disagreed and offered a lower amount. Following advice from fellow director Francis Ford Coppola, Lee got "the movie company pregnant": taking the movie far enough along into actual production to attempt to force the studio to increase the budget. The film, initially budgeted at $28 million, climbed to nearly $33 million. Lee contributed $2 million of his own $3 million salary. Completion Bond Company, which assumed financial control in January 1992, refused to approve any more expenditures; in addition, the studio and bond company instructed Lee that the film could be no longer than two hours, fifteen minutes in length. The resulting conflict caused the project to be shut down in post-production. The film was saved by the financial intervention of prominent black Americans, some of whom appear in the film: Bill Cosby, Oprah Winfrey, Michael Jordan, Magic Johnson, Janet Jackson, Prince, and Peggy Cooper Cafritz, founder of the Duke Ellington School of the Arts. Their contributions were made as donations; as Lee noted: "This is not a loan. They are not investing in the film. These are black folks with some money who came to the rescue of the movie. As a result, this film will be my version. Not the bond company's version, not Warner Brothers'. I will do the film the way it ought to be, and it will be over three hours." The actions of such prominent members of the African American community giving their money helped finish the project as Lee envisioned it. "I'm doing what every other person in Hollywood does: they dictate who they want to do interviews with. Tom Cruise, Robert Redford, whoever. People throw their weight around. Well, I get many requests now for interviews, and I would like African-Americans to interview me. [. . .] Spike Lee has never said he only wants black journalists to interview him. What I'm doing is using whatever clout I have to get qualified African-Americans assignments. The real crime is white publications don't have black writers, that's the crime." A month before the film was released, Lee asked that media outlets send black journalists to interview him. The request proved controversial. While it was common practice for celebrities to pick interviewers who were known to be sympathetic to them, it was the first time in many years in which race had been used as a qualification. Lee clarified that he was not barring white interviewers from interviewing him, but that he felt, given the subject matter of the film, that black writers have "more insight about Malcolm than white writers." The request was turned down by the Los Angeles Times, but several others agreed including Premiere magazine, Vogue, Interview and Rolling Stone. The Los Angeles Times explained they did not give writer approval. The editor of Premiere noted that the request created internal discussions that resulted in changes at the magazine: "Had we had a history of putting a lot of black writers on stories about the movie industry we'd be in a stronger position. But we didn't. It was an interesting challenge he laid down. It caused some personnel changes. We've hired a black writer and a black editor." Malcolm X's widow, Dr. Betty Shabazz, served as a consultant to the film. The Fruit of Islam, the defense arm of the Nation of Islam, provided security for the movie. When Denzel Washington took the role of Malcolm X in the play, When the Chickens Come Home to Roost, which dealt with the relationship between Malcolm X and Elijah Muhammad, he admitted he knew little about Malcolm X and had not yet read The Autobiography of Malcolm X. Washington prepared by reading books and articles by and about Malcolm X and went over hours of tape and film footage of speeches. The play opened in 1981 and earned Washington a warm review by Frank Rich, who was at the time the chief theater critic of The New York Times. Upon being cast in the film, he interviewed people who knew Malcolm X, among them Betty Shabazz and two of his brothers. Although they had different upbringings, Washington tried to focus on what he had in common with his character: Washington was close to Malcolm X's age when he was assassinated, both men were from large families, both of their fathers were ministers, and both were raised primarily by their mothers. Malcolm X is the first non-documentary, and the first American film, to be given permission to film in Mecca (or within the Haram Sharif). A second unit film crew was hired to film in Mecca because non-Muslims, such as Lee, are not allowed inside the city. Lee fought very hard to get filming in Mecca but Warner Bros. initially refused to put up the money for location shooting. New Jersey was considered for filming the Mecca segments. In the end, Lee got money and permission together for filming in Mecca. In addition to Nelson Mandela, the film featured cameos by Christopher Plummer (as the prison's Catholic chaplain), Peter Boyle (as a police officer), William Kunstler (as a judge), as well as activists Al Sharpton and Black Panther Party co-founder Bobby Seale (as street preachers). The film was made shortly after Mandela's 1990 release from prison and during the negotiations to end apartheid in South Africa. Lee explained that he made "the connection between Soweto and Harlem, Nelson and Malcolm, and what Malcolm talked about: pan-Africanism, trying to build these bridges between people of color. He is alive in children in classrooms in Harlem, in classrooms in Soweto." Mandela ends the film with a quote from Malcolm X himself, with Malcolm in a film clip saying the last four words. The quote goes: "We declare our right on this earth, to be a human being, to be respected as a human being, to be given the rights of a human being, in this society, on this earth, in this day, which we intend to bring into existence by any means necessary." Malcolm X was released in North America on November 18, 1992. The film was critically acclaimed, and has since garnered a score of 89% on movie review aggregator Rotten Tomatoes based on 56 reviews. Denzel Washington's portrayal of Malcolm X was widely praised and he was nominated for the Academy Award for Best Actor. Washington lost to Al Pacino (Scent of a Woman), a decision which Lee criticized, saying "I'm not the only one who thinks Denzel was robbed on that one." Washington won the Silver Bear for Best Actor at the 43rd Berlin International Film Festival. The movie received a number of awards at other festivals. The film grossed $9,871,125 in its opening weekend and finished third after Home Alone 2: Lost in New York ($30 million) and Bram Stoker's Dracula ($15 million). According to Box Office Mojo, the film ended its run with a gross of $48,169,610. The film was widely praised upon its release. Roger Ebert ranked it No. 1 on his Top 10 list for 1992 and described the film as "one of the great screen biographies, celebrating the sweep of an American life that bottomed out in prison before its hero reinvented himself." Ebert and Martin Scorsese both ranked Malcolm X among the ten best films of the 1990s. In 2010, Malcolm X was selected for preservation in the United States National Film Registry by the Library of Congress as being "culturally, historically, or aesthetically significant". ^ "Malcolm X (1992)". Box Office Mojo. Retrieved October 18, 2008. ^ Bernard Weinraub, A Movie Producer Remembers The Human Side of Malcolm X, The New York Times, November 23, 1992; retrieved June 18, 2008. ^ a b c d e f Bernard Weinraub, A Movie Producer Remembers The Human Side of Malcolm X, The New York Times, November 23, 1992; retrieved June 8, 2008. ^ a b Sheila Rule, FILM; Malcolm X: The Facts, the Fictions, the Film, The New York Times, November 15, 1992; accessed May 23, 2008. ^ Baldwin, James (1976). The Devil Finds Work. New York: The Dial Press. p. 95. ISBN 0-8037-1916-7. ^ a b c d e f g h David Ansen and Spike Lee, The Battle For Malcolm X, Newsweek, Retrieved May 31, 2010. ^ a b c d Scott Tobias, Malcolm X, The Onion A/V Club, February 15, 2005, Retrieved February 19, 2014. ^ a b c d Evelyn Nieves, Malcolm X: Firestorm Over a Film Script, The New York Times, August 9, 1991; retrieved May 15, 2008. ^ a b c Lena Williams, Spike Lee Says Money From Blacks Saved 'X', The New York Times, May 20, 1992; retrieved May 15, 2008. ^ Nat Tunbridge (April 11, 2005). "Malcolm X: Special Edition". DVD Times. Retrieved October 3, 2009. ^ a b c Lena Williams, Playing With Fire, The New York Times, October 25, 1992; retrieved May 15, 2008. ^ a b c Bernard Weinraub, Spike Lee's Request: Black Interviewers Only, The New York Times, October 29, 1992, Retrieved May 23, 2008. ^ Spike., Lee, (2002). Spike Lee : interviews. Fuchs, Cynthia. Jackson: University Press of Mississippi. ISBN 1578064708. OCLC 48163614. ^ Vincent Canby, Review/Film; 'Malcolm X', as Complex as Its Subject, The New York Times, November 18, 1992, Retrieved May 23, 2008. ^ "Malcolm X Movie Reviews, Pictures". Rotten Tomatoes. Retrieved July 18, 2010. ^ DVDTalk.com. "Spike Lee on Malcolm X". Dvdtalk.com. Retrieved July 18, 2010. ^ "Berlinale: 1993 Prize Winners". berlinale.de. Retrieved June 1, 2011. ^ "Malcolm X (1992) : Awards". IMDb.com. Retrieved 2016-01-27. ^ Ebert, Roger (December 31, 1992). "The Best 10 Movies of 1992". rogerebert.com. Retrieved March 15, 2011. ^ Anderson, Jeffrey M. "The Best Films of the 1990s". Combustible Celluloid. Retrieved June 21, 2010. ^ Barnes, Mike (December 28, 2010). "'Empire Strikes Back', 'Airplane!' Among 25 Movies Named to National Film Registry". The Hollywood Reporter. Retrieved December 28, 2010. ^ "AFI's Top 10 Epic Nominees". Retrieved 2016-08-14. This page was last edited on 1 April 2019, at 02:33 (UTC).